 Known primarily as a novelist (Working Men, 1993; Morning Girls, 1992; The Crown of Columbus with his wife, Louise Erdrich, 1991) and for The Broken Cord, which described his oldest son Abel's affliction with fetal alcohol syndrome (FAS), Dorris here offers an array of previously published essays. Some are personal, about growing up and becoming a parent; some are polemical, concerning Native Americans and their history. However diverse the original audiences--the pieces appeared in the New York Times, Family Circle, TV Guide, and elsewhere--Dorris' engaging and incisive style holds them all together. Part Indian himself, raised by his war-widowed mother, grandmother, and aunt, and the adoptive single parent of three Indian children (before his marriage to Erdrich), Dorris brings a rare sensitivity and a unique point of view to such universal experiences as baking a cake for his son's nursery school party, traveling cross-country with his children, finding the ``great pie,'' and piercing his son's ear. The heavy observations begin with the adolescence of his children, all three of whom suffered from FAS (which he described for Newsweek and in a report for the Centers for Disease Control). He evokes the frustrations and resourcefulness of a parent whose children are prone to unpredictable, sometimes violent behavior. He recounts how Abel died after being struck by a motorist just as filming began for a TV movie of the The Broken Cord. 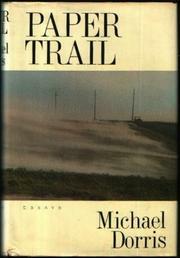 Much of Paper Trail is about Native Americans and the stereotypes, realities, and cultural fictions that perpetuate their marginal status in America. Though all the essays are grounded in a sense of private history, Dorris does consider, more generally, questions about the nature and function of history. In such pieces, the novelist becomes a cultural commentator, learned, persuasive, overcoming guilt by issuing a call for responsibility. Collectively, the essays evoke the pathos, joy, and mystery of unaccountable suffering and unbearable loss, of spiritual triumph and enduring love, conveying universal experiences in a simple and touching language.